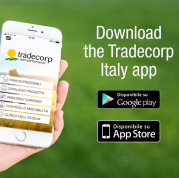 Tradecorp Italy, has developed an innovative app to help farmers improve crop yield and quality by identifying nutrient deficiencies and providing the best practical solutions quickly and efficiently in the field. When accessing this tab, the user is offered a wide range of crops to choose from. Once the type of crop has been selected, a series of products is then displayed to be used in different phases of the crop cycle. Here, users can easily access key information on all the main crop needs as well as the best Tradecorp solutions to improve their crops quality and yield. This section contains the majority of Tradecorp products, including those allowed in organic farming, divided by ranges. The catalog includes company videos that correspond to each product, providing a visual description of how each product works. This section is divided by crops, in each one, the user can find photos of the main deficiencies that can occur on the crop itself. Once the user identifies the exact deficiency affecting their cultivation, a detailed description of the deficit is offered, along with Tradecorp solutions to help correct the problem, as well as a list of risk factors that may have caused the deficit. The compatibility section offers a step-by-step procedure to check the compatibility of different mixtures of products. This information is important for farmers and aims to ensure safe and effective application for their crops. The Water Clinic tool, is designed to optimize the quality of the water used, adjusting the mixture according to the pH of the water and its hardness. This can be done by simply calculating the correct dose of Spray Plus needed to add to the tank.